What is in frame lamination and how is it? Do you really need the 4 in 1 glass for iphone LCD refurbishing? The 4 in 1 glass is a very popular glass for iphone LCD refurbishing now, this glass comes with cold press frame, oca glue and polarizer film, all of those material is the A++ grade quality, almost 99% near the original quality made by foxconn, and we believe it is really good enough for most of the customers, this glass does not have apple logo, so never worry about if it is illegal. OCAmaster has 2 kind of machines, they are all in one model & separated model, all in one model means the laminator, vacuum pump, air compressor, bubble remover all built in one machine (such as K5, K5i, K5EDGE, K6EDGE), those machines are very popular for a individual repair shop since it won't take too much space from your table. some people said the all in one machine is not good because if any components damaged, fixing it will be a problem. What tools/moulds do I need in order to use them in the old OM-K5 laminator machine? Cold press framed glass is getting very popular now, the glass comes with cold press frame on it, the advantage of cold press framed glass is that the glue is very steady after a long time, means the frame won't separate from the glass easily like hot glue frame. How to use OM-K6EDGE? read this manual instruction please. Do we really need the cold press framed glass for the cracked iphone LCD refurbishing? The cold press framed glass got very popular from 1 year ago, it was a new technology for making iphone's LCD refurbishing more faster, the glass come with a frame laminated with cold glue, the advantage of the cold glue is that it won't deteriorate after few months and lose viscidity (most of the hot glue laminated frame got easily separated from the glass after few months ). 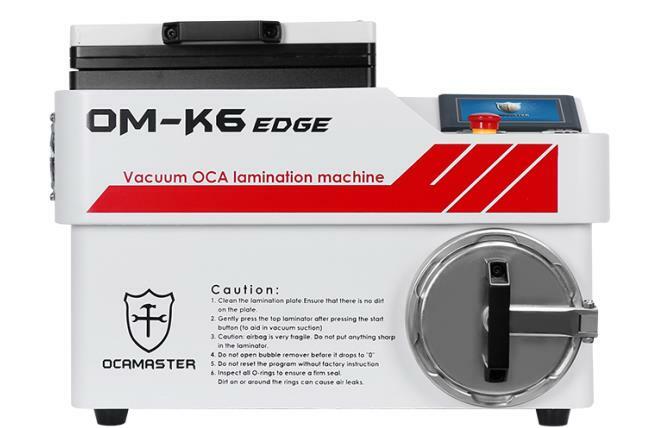 Many clients had the same question (or we can call it problem) after they bought the air bag OCA laminator (such as OM-K6edge, K5edge), the problem is that their machine keep pumping vacuum and never start the second step (Lamination step), sometimes they even can smell the burn from inside. Las Vegas 2016 CTIA Show, OCAmaster was there. How is air bag OCA lamination machine for iphone LCD repairing? We use the best quality vacuum motor for this machine which can work over 15 years, and all other spare parts can be sent soon if client need it. we offer 12 months warranty for the machine. The Samsung S10 Edge was first released less than a year ago, and many users are having issues already with broken and cracked screens. In fact, it was the worst ranking phone in Square Trade's bendability test - This means that the screen bends often, breaking the glass. Repairing a broken screen is obviously not possible, so it must be replaced. In this guide we will explain the methods of cracked Samsung S10 OLED touch screen repairing. A good air bag oca lamination machine should have the latest technology. Before you can be in a position of buying one, you must be aware of the technology it uses since this will affect its efficiency when using it. Those who have tried it have always been satisfied by the quality of air bag oca lamination machine when buying one from the market. Why should you repair your cracked phone screen using an LCD phone repair machine? Iphone is probably the most expensive smart phones today whose maintenance requires proper care and attention. Well, for many people who own a smart phone like an iphone, what usually poses a big challenge is when the phone breaks down and particularly where to find the genuine repair parts or buy a new genuine smart phone that will serve you better and for longer. You need not risk the usability of your device by relying on other options to fix the problem. Our lamination machines are what you need to continue enjoying the rewards of your investment. Perhaps there is something you want clarified so feel free to talk to us or visit our premises. We are waiting to serve you. The OLED screen should be replaced when is damaged by cracks or scuff marks. More so it needs to be replaced when it is damaged to the extent it can no longer display an image, this may due to cracking of the thin and highly fragile Liquid Crystal Display unit. This is common despite it being protected by a Corning Gorilla Glass 4. OCAmaster is a well-known manufacturing company that is currently under the spotlight. There is a high demand for the machines sold by OCAmaster and has served the entire Europe, North America, South America and other Western countries. What comes to mind when hearing the word mobile phone screen recycling? Ocamaster has been giving the reputation of screen recycling a good name; with quality machines and accessories this industry can finally prosper. All the machines have been designed with the user in mind and tested as well as used by the company itself. To find the best LCD separator machine is itself in a very difficult task. You would always require one for your repair needs. There are many things that have to be kept in mind while choosing the right LCD Screen Glass Separator. So if you are interested in buying LCD Screen Glass Separator, you would already be knowing about repairing current devices. So if you really want to maximize your profit and do all the repairing work faster, you would need the right machine for your repairing work. There are many companies out there offering to fix your phone screen at competitive rates but what if you could do it at home yourself? If you are prone to dropping your IPhone at any given time wouldn’t it be easier and more cost effective just to have the equipment and tools to repair it without having to drop it off at a repair shop?